To Christchurch Priory (left) belongs the distinction of being the longest parish church in England; it is renowned also for the very fine Norman work on the exterior of the north transept, and for its Norman nave and triforium. Under the west tower is a monument to Shelley. The main entrance is by the early 14th-century north porch shown in the photograph. 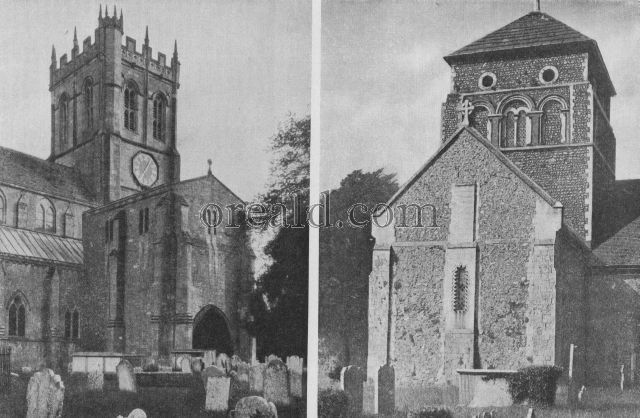 Old Shoreham Church (right) is one of the most interesting of Sussex parish churches. The oldest portion is the north wall of the nave, which exhibits traces of the Saxon period ; but the chief architectural feature are the four great arches where nave and transepts cross. These date from the 12th century. The zigzag mouldings round the Early Norman windows are particularly good of their kind.